A koldūnas in hand, showing its fluted edge. still have that old grinder, and I cherish it. 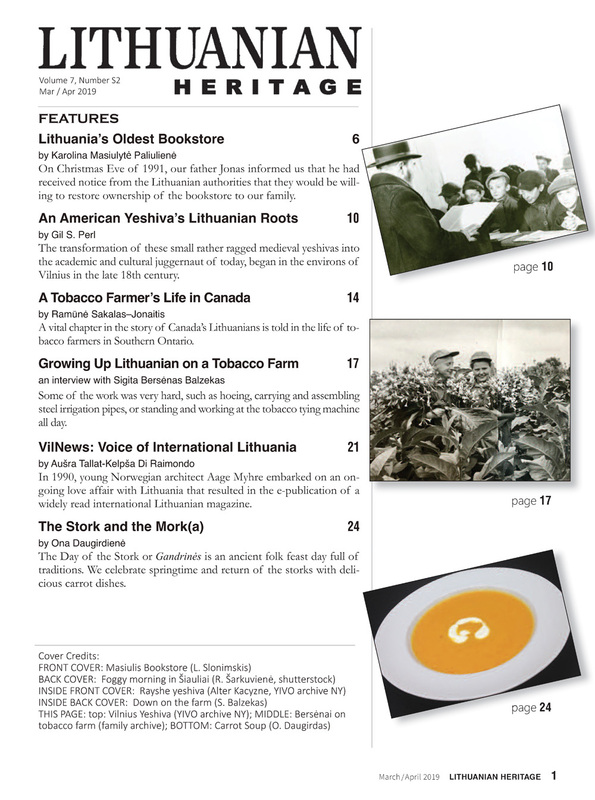 Of all the Lithuanian recipes my parents brought to the US, koldūnai were always my favorite. Dumplings filled with beef and drowned in butter! Making them was an event bringing all of the family together in the kitchen for hours of work, laughter, and talk. Everyone had some part of the task to contribute, and then we would enjoy a feast. An on-line search will show many versions of the recipe. 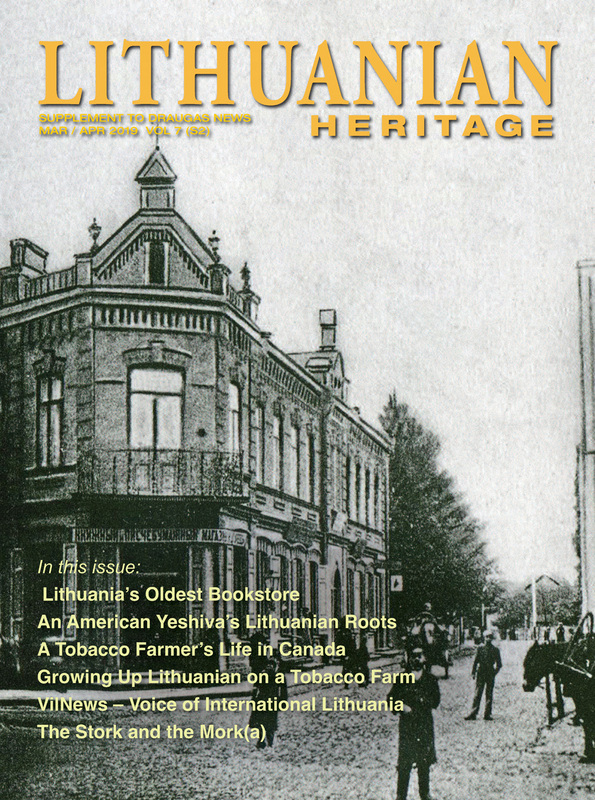 I suppose they trace back to different regions and seasons within Lithuania and different family traditions both there and after emigration. Fillings vary, but we would make them with beef, often mixed with pork or lamb. I don’t know if that’s the style in Kaunas, where my mother grew up in the 1920s, but I consider this method to be a glimpse into those times. Here’s how we would do it, with a few pictures. Making the koldūnai was a division of labor. 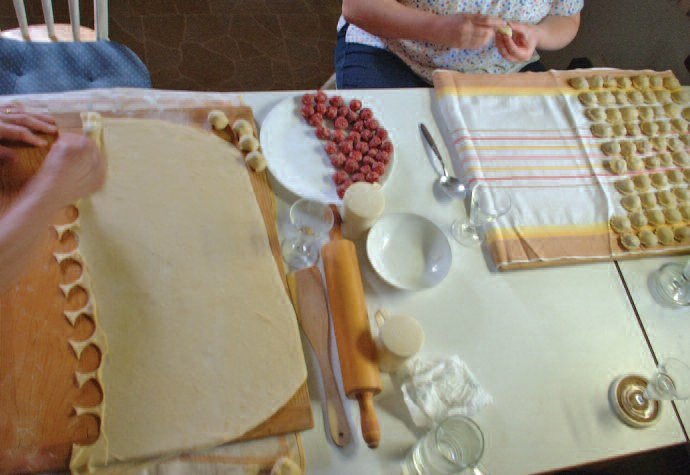 My mother and sister would work on making the dough, similar to a noodle dough, with flour, egg, and water. I’d be at the other end of the room with my father and grandfather, cranking the cubed meat through a 1950s ChopRite #10 meat grinder clamped to a table. We used a 3/8-inch “hamburger” plate on the grinder. 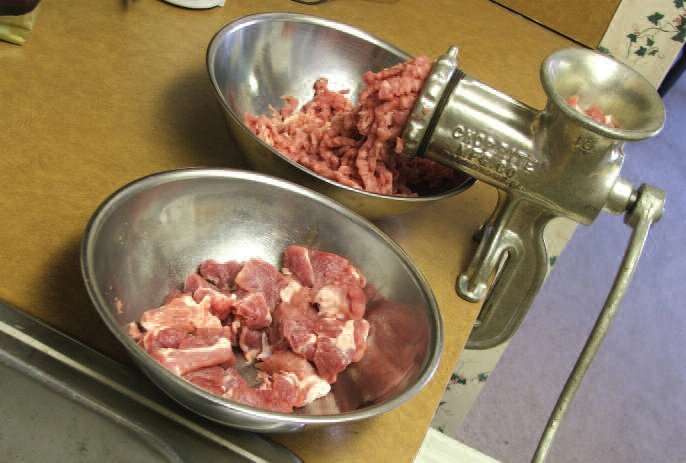 Dad and Grandfather would steal bits of ground meat and put them on slices of rye bread with onion, salt, and vodka, and laugh at eight-year-old me trying to turn the big grinder crank until I became too tired. Years later, my parents got a stand mixer with a grinder attachment and gave the old grinder to me. I still have that grinder, and I cherish it. 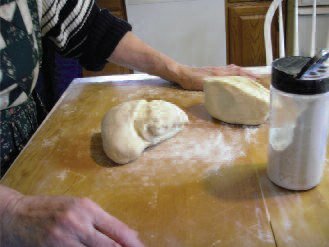 The dough is transferred to a floured pastry board. We would beat the eggs, add salt and water, then start mixing with flour in a bowl. (It’s more convenient to mix these ingredients in a food processor, for faster, smoother results.) When mixed, we transferred the dough to a floured pastry board to make a firmer, workable dough, ready for rolling. This required sprinkling more flour to prevent sticking. We divided the dough in half for easier handling. Then we would roll one half to a 1/8-inch thickness and keep the rest in a bowl covered with a damp kitchen towel. As we all grew older, the rolling task shifted to me. The force of rolling the dough made the table slide around. With the meat ground and seasoned, and the dough mixed, two activities went on at once at the kitchen table. 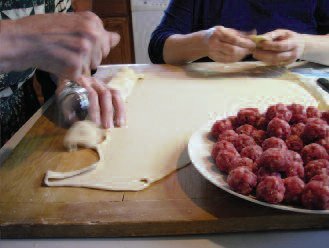 Rolling the meatballs was my task, often helped by my father. I would roll them and arrange them to wait on a plate, usually with my mother scolding me for making them too large. Mass production! Laying out the meatballs on the assembly line. 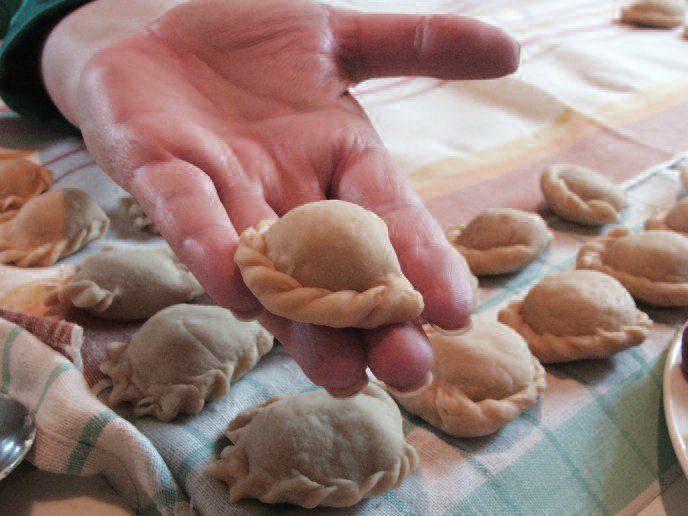 She said there’s an old Lithuanian joke that when a maiden was courting her beau, she would make tiny, delicate, and beautiful dumplings to impress him. Then, after they had been married for a few years, she would just make a few big ones—and there’s his dinner. It’s tricky to get a uniform thickness of dough and not stick it to the board or tear it. Once the dough was rolled, we cut off a straight edge. Any scrap dough went back into the bowl to be worked in with the remaining dough. That is, if I didn’t steal a bite of it. 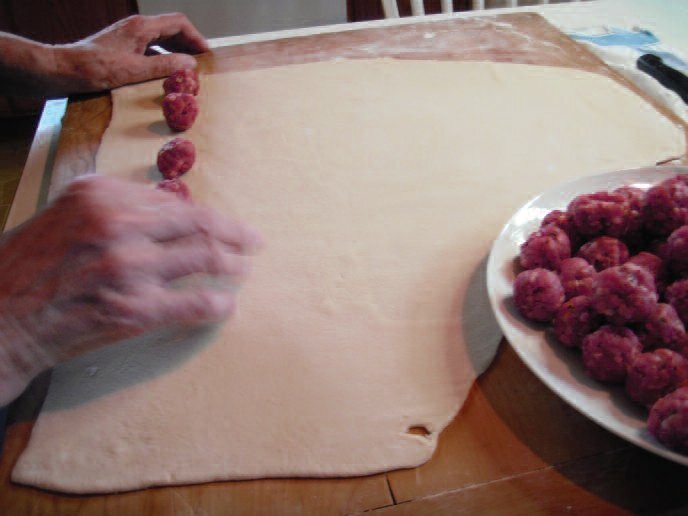 My mother would lay out a line of meatballs and fold the dough over them. Then she would use a stemmed wineglass to cut circles of dough around each meatball. That made the dumplings, but they still had to be finished. The cutting left a fringe of dough with circles missing; this was cut off to make a new straight edge and sent back to the dough bowl. As my mother set the unfinished dumplings off to the side, my sister would take them one by one and flute the edges. This was the one part of the process that took me years to learn. I won’t say “master,” because I still can’t do it as neatly as they could. 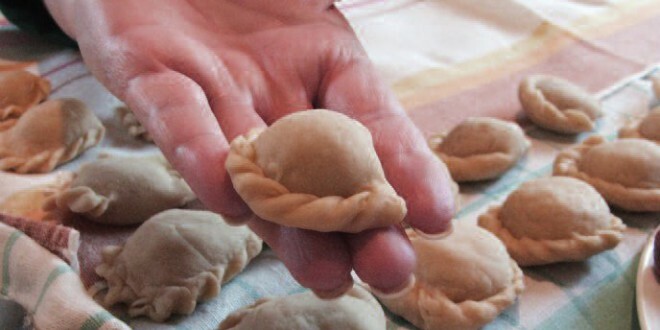 It requires pinching the dough shut, making a flat ring around the dumpling. Then, with a combined twist and fold, the edge was sealed, leaving an attractive dumpling, fluted like a pie crust. These would line up in rows on a large tray covered by a kitchen towel. We would count them off by the hundreds. Usually, we ran out of meatballs before we ran out of dough. In that case, we would make simple dough dumplings by rolling out a rope of dough, then cutting it into two-inch lengths. 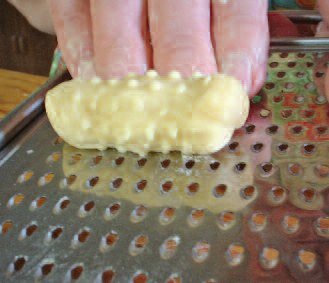 Then we would press and roll these against the back of a fine cheese grater, so the dough would press into the holes and make “goose bumps” as the dough rolled back over the fingertips. We would repeat this, line after line, until the dough was used up. Then the next ball of dough was rolled out, and the process would repeat. Meanwhile, a large pot of salted water would be working up to a vigorous rolling boil. It was a two-person task to drop in the dumplings, two or three at a time, without splashing anyone with boiling water. As with cooking pasta, the pot shouldn’t get too crowded. The koldūnai would cool the water at first, and they’d need an occasional stir to prevent sticking. 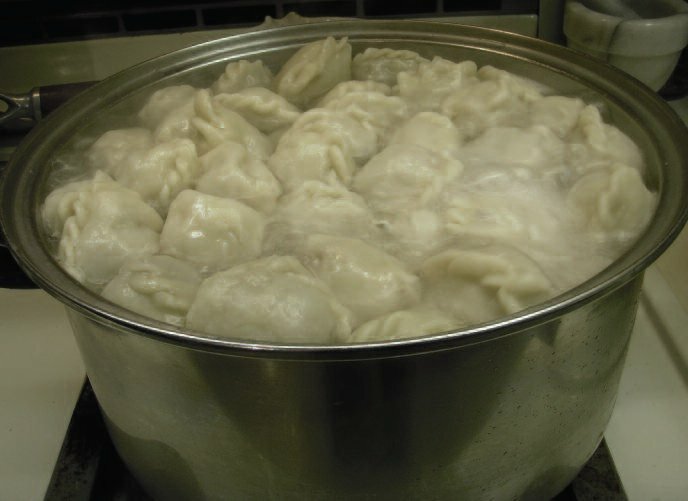 But soon the boil would return, and as the dumplings began to cook, they would float to the top. Then we would cook them for another five or six minutes, removing them with a slotted spoon to save the hot water for the next batch. Sometimes, a few dumplings would burst, leaving freeroaming meatballs and empty pockets of dough. Time to eat! Melt the butter! Sprinkle some salt, maybe some pepper, and pour the chilled vodka. We would quickly finish the first batch while the second batch cooked. Sometimes, around the end of the second batch, we would start to slow down and lean back away from the table. Using a cheese grater to make “goose bumps” on extra pieces of dough for meatless dumplings. We would call these birbizai. And then, there were the leftovers. What to do with refrigerated dumplings partially embedded in solidified butter? Get a skillet. We would fry them to a golden brown; many a wintertime breakfast was made this way. Now both of my parents have passed away, and my sister lives out of state. There’s no big family left to make and eat a big production like this. I made sure to photograph the process, and I have the recipe my father typed into his computer thirty years ago. When my mother became infirm, my sister and I made a batch by ourselves, under her supervision, to show that the tradition would not die with her. Instead of meat, you may also use: dry cottage cheese mixed with eggs and with your favorite flavorings, or, during the summertime, one could use berries (blueberries are favored). Serve these with sweet cream, sour cream and sugar. Almost done. The koldūnai have floated to the top of the water; five to six minutes more and they’re ready to serve.